Today I think I’ll take the metal thermometer that sits on my desk (I found this particular thermometer stuck in the sand on the banks of the Black Warrior River in Alabama in 1965, but that’s another story) and stick it in the garden soil. Whatever temperature it tells me will be a few degrees below the soil temp it takes to bring about reliable seed germination. The garden is too cool yet and seeds are just sitting there. In our zeal (and in spite of my insistence that it was too early yet) we put out peas, beans and corn at least a week ago. Germination is very spotty, a sprout here and there, and I can’t dedicate our very limited space for empty stretches between the occasional future pea plant. I’ll give it another week with the hope of warmer days and nights (for the garden’s sake, not the gardeners’. I’ve been quite happy with COOL!) We’ve gotten good rain, but not enough heat–so far–which is why my rule in recent gardening years has been to not jump the gun (as she convinced me this year to do against my better judgement), to plant seed crops only after the first of June when the ground down in this deep valley warms up so seeds don’t rot. The alarm to drain the water filtration tank popped up, and like most alarms, I snoozed it for almost a week until yesterday. I was going to be string-trimming the remains of the Jonquils along the branch anyway (and the tall grasses down in the wet depression where the temporary stream flows) so might as well open the door to what was a root cellar when we first saw the place and connect the garden hose and open the valve and let iron-tainted rust-colored water flow out of the tank and into the grass of the front yard. Lo in the darkness, there were the screens that had been moved off the wooden love seat I’d tugged out of the cellar, up and over the rock wall, to put on the back porch for Abby’s friends that came to visit us while she was here two weeks ago. I’d moved the screens in front of the tank, so while I was draining the tank, having put down the string trimmer, I moved the screens out of the way and up onto the back porch. And of course, I couldn’t have the screens as an unsightly greeting when She got home, so I forgot about the string trimmer, remembered to turn the water off after 10 minutes, and began installing screens. It was just starting to rain. And thus last night through the screened and open windows, I was able to hear the torrential downpour and know in the wee hours that yesterday’s lettuce and chard seeds that completed the row containing the potatos, the grass seed over the ramped walkway entry into the garden and the buckwheat seeds planted yesterday afternoon as a cover crop to hold the soil over the poorer parts of the garden against erosion were all washing downstream along with more than a few pounds of our topsoil. So I wished I’d snoozed the drain-the-tank alarm at least one more day. I’d have slept better. If misery loves company, then we should be pretty happy. I keep hearing of more folks who once were able to garden unmolested–or should I say unDEERravaged. But once THEY get the taste of something tastier than grass, there’s no turning back. And others I’ve heard about are going vertical so the horizontal is worth the time, expense and sweat-equity that goes into a garden. 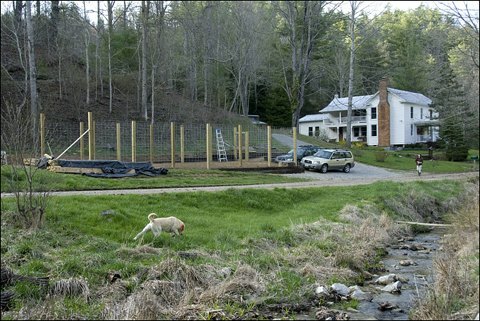 And this garden fence will outlast us by a long shot, and others will reap the harvest of our investment–her investment, really. I would have given up. Between the above ground and below ground invaders, the insects that come earlier each year, the cold soil, the arthritic body parts and the general lassitude of the end of middle age, I would have written off the garden as one of those things once precious and productive of both gratification and groceries. Life goes on, and as one ages, they gradually relent and give things up, rather in reverse order to the gains added in strength, skill and wit as one grows older. I was prepared to let gardening go. I hope I’ll be glad she was determined to invest in the earth–an increasingly wise place to put one’s income as banking on human economies becomes more and more a gamble. But I digress. I’ll show additional shots over the next few weeks and the summer. This one puts the garden in context–below and nearer the house, wedged between the road (plus the county’s cussed 15 foot right of way that eats considerably into our only level potential garden plot) and the bank, which we’ve had to excavate into and then shore up with railroad ties on the house end. Exposure is long side to the southeast. We were limited in the length and stopped where we did opposite the house because to come farther image-left brought us into the septic field. Construction offers not so many options on “mountain land” and you use what you’ve got. Being on the creek is bad in the sense that we are in the low point of a low sheltered valley– a frost pocket–and a growth zone NORTH of the main plateau of the county a mile and a half west and five hundred feet higher than we are. Our hours of sun, of course, are also reduced here (and so is the summer heat that Roanoke will endure. We’re often 10 degrees or more cooler here in July and August. So we’ll need season extending ideas. 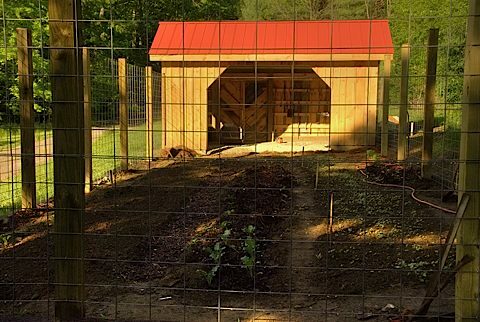 Cold frames, for instance. And someone emailed about “plunge pits”–I haven’t googled that yet, but will. I’m also going to put down some scrap black plastic in a few places for a couple of weeks to see if we can get the soil temps up so seeds don’t rot in our garden when most Floydians have plants a foot high. 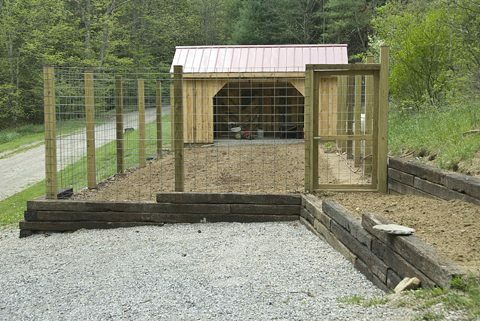 The garden shed will cover the width of the garden and be ten feet deep, open for the most part on the house side. You can see the taller post that will support the header for the metal roof. That work may start today. Bottom line: I’m feeling almost extinguished garden zeal again. We’ll see what comes of it. Stay tuned. Posted on April 18, 2008 Categories From the Soil, HomeAndHearth, nature, PhotoImage1 Comment on Gardening: A Good Investment?